1. Put all the ingredients in a blender (if you want a really smooth finish, use a high-speed one such as a NutriBullet). Season, then whizz until combined. 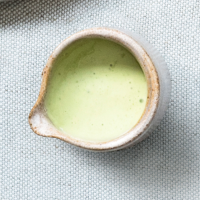 The beauty of this dressing is that it can be made with any soft herbs you have in the fridge (or even a leaf such as watercress). You can also use different dairy products in place of the yogurt – try crème fraîche or soured cream. Add green chilli for spice, or a little ground cumin for depth. Spoon over grain-based or leafy salads, or drizzle over griddled fish, chicken or vegetables.